Can we keep families in Oakland ? In a recent twitter thread, Sally Kuchar detailed the magnitude of the housing affordability crisis in the Bay Area. According to Kuchar, there were 263 homes sold in March 2018 in Oakland, with a median price of $735,000. ​We dug deeper into the sales that were at least 3 bedrooms and made up 47% of the sales. There were 124 sold in March. The median sale price was $912,500. Of these, 92% were detached single family homes with a median price of $972,500. There were only nine condos or townhomes with three bedrooms sold in the entire city in March and the median price was $835,000. These multi-family homes made up less than 4% of the total sales in March. Only one was downtown, where transportation costs could off-set housing costs. It's hard to imagine how we can keep households with a diversity of ages, incomes and household sizes in Oakland. It hard to imagine how current residents can stay. It's hard to imagine we are moving towards positive and racially just housing outcomes for our families and communities. The takeaway: We desperately need to build more 3 bedroom condos and townhomes affordable to range of incomes downtown and throughout the city. 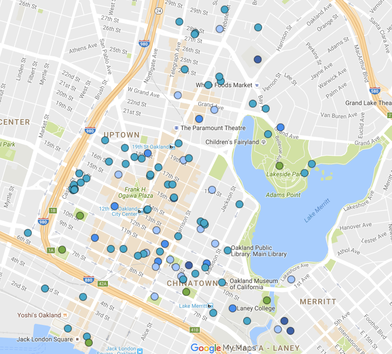 Who is planning for families in Oakland? We reviewed recent reports published in Oakland to better understand how families were being included in city-wide planning discussions on housing, equity, youth development and more. As it turns out, families are often in the periphery of citywide discussions - quite literally. Here's what we found. What does it mean to put families in the middle of planning efforts? For starters, we can lean from other cities. In 2014, the Seattle Housing Commission published a white paper and planning agenda for family sized housing. More locally, the city of Emeryville have also written staff report and conducted study sessions on the topic of family-sized housing. 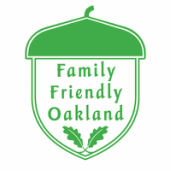 See if and how families are included in Oakland planning! A 100 units built today houses less people than 100 units built 15 years ago. Why? Unit Mix. Over the years we've built less larger sized units like three-bedrooms, and more smaller units like one-bedrooms, studios and micro-apartments. As a result, there's less diversity in the unit mix, and ultimately less diversity in the range of household sizes and types that move in. If you were living in an apartment or condo community, what overall unit mix would you prefer? 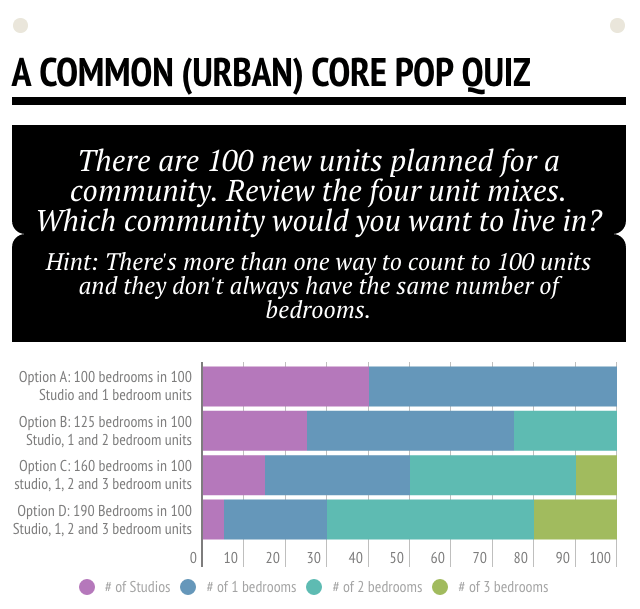 Review these four scenarios and notice how the unit mix affects the total number of bedrooms. ﻿Did you know downtown Oakland is full of schools, parks, youth and family organizations and other family friendly places? Unlike other cities that are rallying to bring schools, parks and family services back downtown, Oakland already has a tremendous amount of resources for our families in our urban core. We may not have a lot of family-sized housing, but we certainly have everything else families need in a family friendly downtown. That said, we need make sure we can to keep these institutions and services from getting squeezed out. Have a look at this map and see everything that downtown Oakland has to offer people of all ages. Explore Family Friendly downtown Oakland! Why are there so many strollers yet so few students living downtown? 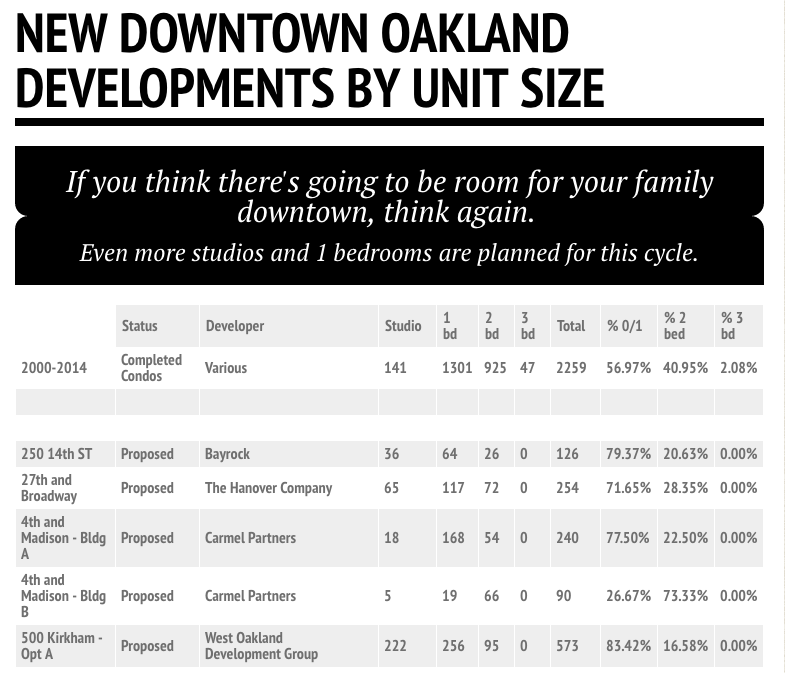 During Oakland's last real estate development cycle, we built a lot of condos downtown. Over 2,300 of them! But looking back at the data, it seems we didn't leave much room for families to grow. Over 2,200 condos were added downtown, but only 47 of these units were three-bedrooms. Check out this infographic which allows you to search developments and unit counts by years and by buildings. We compiled the data for this chart from multiple sometimes conflicting public and private sources. Data on multi-family apartments has been requested from the city of Oakland, but is apparently not readily available. In the last development cycle, 3 bedroom condos downtown only accounted for 2% of the units built, but 2 bedrooms made up nearly 41%. As it stands now, less than 1% of the units will have 3 bedrooms and only 27% of the units will be 3 bedroom. This chart shows data that has been tediously tallied by reviewing the planning commission agendas, searching for staff reports, and then attempting to read scanned architectural submittals. Sometimes this data is not available online and we must ask City staff for unit breakdowns. ​Oakland does not always include unit mix breakdowns in staff reports to the Planning Commission and City Council since there are no restrictions in what developers can build. The only exception we've found is for affordable housing developments, in which case the City does require and track more family-sized units. Oakland - the worst place to raise a family? WalletHub recently ranked 240 California cities by their family-friendliness, including such metrics as affordability, family fun, education, health and safety, and socioeconomic environment. Oakland was ranked LAST at 240. Out of 240. ​Could that possibly be right? Perhaps the metrics are clearly lacking some indicators - like trash can playfulness, diversity of family-friendly dining options or most family friendly Octoberfest (Oaktoberfest) and pride celebrations. But seriously, what other indicators are missing and what can we do to boost our ranking? Click on the cities on the map to view the rank or view the article for the full ranking. "Planners must actively seek meaningful input from families, low-income renters, young people and those unable to attend public meetings." Keep these tips in mind as you plan your next community meeting.